New picture books from German publishers introduce children to themes relating to refugees, war and xenophobia. Escape, banishment and unpredictable journeys are important themes in Grimm’s fairy-tales. No matter how relevant to the social challenges of our times some of their motives may sound, however, contemporary publications are without doubt better suited to gently introducing nursery-age and pre-school children to such big issues. 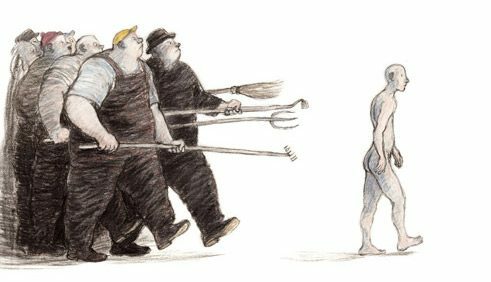 Publishing houses in Germany have brought out a whole host of picture books about refugees and foreignness. They provide an opportunity to discuss these matters with children and promote understanding – ideally for the problems faced by both the refugees and the people of the country in which they ultimately arrive. In Am Tag, als Saída zu uns kam (The Day Saída Arrived), a picture book by Susana Gómez Redondo with illustrations by Sonja Wimmer that was published by the Peter Hammer Verlag in February 2016, a lively and exuberant young girl tells about the arrival of a taciturn and sad girl of her own age from Morocco. “The day Saída arrived, I knew immediately that I would always like her”, she explains on one of the first pages. Eventually she finds out that her new friend may not be mute after all: “Perhaps she simply didn’t want to speak her language because it was different to ours.” The two girls point at things and name them, learning from one another, and the new friend takes pleasure in the Arabic letters, the way the language is written from right to left, and its sound. This mutual process of discovery becomes a poetical game with dream-like images full of words and characters that also bring the two girls ever closer together: how easy and pleasant it can be too overcome one’s foreignness when one knows straightaway that one will like each other. “Die Insel”; | © Armin Greder/FISCHER Sauerländer What happens when one knows straightaway that one would most like to send the new arrival away again is the subject of Armin Greder’s picture book Die Insel (The Island), which was originally published in 2002 and is now available in a new Sauerländer Verlag edition. The island’s inhabitants recognize immediately that the man who is washed up on the beach with his raft “was not like them”: he is naked. The fisherman knows that the man would die out at sea. “So they took him in”. We see how corpulent, grim-looking men drive the shipwrecked man before them with brooms, rakes and pitchforks. So this is the kind of reception one can expect in a world where people have nothing more than a goat pen and pigswill to offer a stranger – and who nonetheless whip up each other’s fears and anger to the point where everyone decides that the best thing is to send the man back out to sea on his raft. This is a dark tale told in dark images; a clear message that makes it clear even to pre-school children what xenophobia is and how little it may actually have to do with the foreigners themselves. 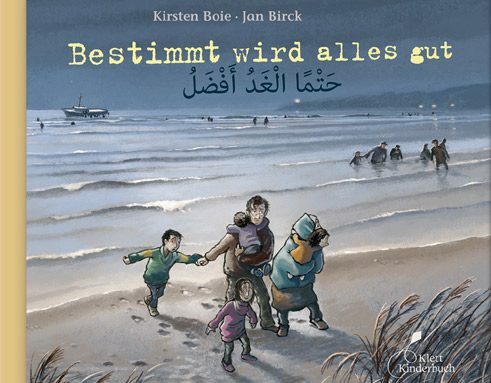 “Bestimmt wird alles gut”; | © Klett Verlag Published by Klett Kinderbuch in January 2016, Bestimmt wird alles gut (Everything Will Be All Right) by Kirsten Boie expresses hope even in its title, and it is this hope that carries nine-year-old Hassan and his ten-year-old sister Rahaf from Homs through the entire story. The fact that key aspects of their life are indeed better – though by no means good – by the end shows how carefully and gently this children’s book author tells their tale, but without sugar-coating it: she does not confront her heroes or readers with dying bomb victims in devastated cities or shipwrecked people making the hazardous crossing of the Mediterranean. And yet she does make it quite clear what the refugees have gone through – and have yet to face once they arrive in Europe. After three months in the reception camp, the children are separated from their new-found friends. Some of the girls in her class approach Rahaf with curiosity, but quickly lose interest in the girl from Syria because of the language barrier. The father’s hope that he will be able to work again as a doctor in Germany is not realized by the end of the book, and the family of six is still sharing a three-bed room in a container facility. However, when the father sees an accident on the road, he is able to help before the paramedics arrive, and therefore has a chance to demonstrate his medical skills. The Arabic translation of the story is provided in the bottom half of each page, and a first few words and sentences in both languages can be found at the end – from “What is your name?” and “Do you want to?” to “Do you want to be my friend?”. Phrases like “Leave me in peace!” and “I don’t want to!” are also included, however. As such, Bestimmt wird alles gut is not only about a new beginning in a foreign country, but also helps make a new beginning of this kind somewhat easier. Fridtjof Küchemann is an editor in the online features section of “Frankfurter Allgemeine Zeitung”. Copyright: Text: Goethe-Institut, Fridtjof Küchemann. This work is licensed under a Creative Commons Germany Attribution – NoDerivs 3.0 Germany license.